I am loving the Huggabuggs! They are too cute! Oh wow how nice of you. I am sure you will get loads of readers now with this announcement. I love everything Em puts out but I am truly digging those cute lil' bugs right now. Still love the bellas and tiddlys but I just can't resist those cute bugs. Wow... how nice are you. COngrats and thanks for the change to win. I just ordered from Em for the first time. 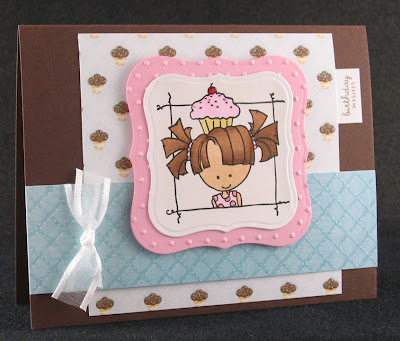 After seeing your card I'm wishing I had gotten Is that a cupcake on your head? .... looks like that could turn into my favorite!! (I love cupcakes too) Thanks for the chance to win. My favorite Bella depends on my mood. Right now it's Sposabella. I'm using her for my daughters shower invites. wow - you lucky thing! and generous too. love your cards btw - the nesties are great with them too. don't know which is my fave bella - i only have a couple, but I just love THEM ALL!!! Hello and thanks for sharing some of your goodies! I really love Matilda Muffinbread and Miniwagonbella (who reminds me of my daughter Reilly with her toys). I can't pick just one favorite so I'll just say the last one I bought was my favorite. I don't remember the name but it was a young girl with a poodle. I am a poodle fancier and tend to buy any stamp that has a poodle on it. Anyone else out there a poodle fancier? Thanks for the blog candy. Of course my Fave is stampabella. (the only 1 I have so far) Saved your blog to my faves. How awesome to share your blog candy! My fav bella right now is the peopny bittybloom (I don't even have her but got some RAK images.) I do have several other bellas though.... Thanks for teh candy opportunity! This is so cool - how nice of you to share - my favorite bella is teeoffabella - she is one of the best golfing stamps for woman out there! WOW!! !This is so extremely generous of you. There's no way I would be able to pick one, I love everything Bella. One of my most fav's is balloonabell, and the huggabuggs, and the chichiboulie's. See, I told you I can't pick one. WOW!! So nice of you to share your prize. I love all my bella stamps, but I really love the Bitty blooms. It is impossible fdor my to choose just one. Thanks for the chance to win. Great blog candy, and very generous of you. A favorite bella...hmmmm...I'd have to say my favorite is Snowbunnybella...I'm using her to make Christmas cards right now! In January! Great blog...like your work a lot. I love the cupcake one too. I'm obsessed with cupcakes too, you can see that on my blog. this is very nice of you! my favorite image is pmsbella, she is so me. Kayla T.
You are SO generous to share your winnings with us! My favorite Bella is Winobella! I just love that leg kicked up and the way the glasses are tilted :o) I love your blog and will be back to keep up with your cards! My favorite Bella is causabella because she can be used for any ribbon-related cause! Your cards are lovely and thanks for the chance to win! oh man how lucky are you to win all those awesome stamps! and how special you are to share with us!!! my fav bella right now is the beetlehuggabug even though i don't have it yet -- it's in my cart for my order to be placed tonight! Wow! 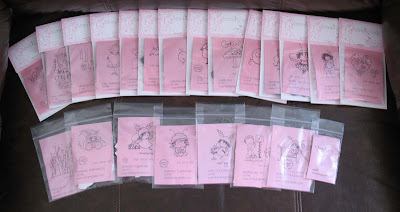 What a great blog candy for you to win & thanks for sharing! I love their stamps, but, haven't been able to purchase much. I like the Supermom bella (not sure of the name) as we moms are "superwomen." I just left a comment & am not sure why it came up anonymous (my favorite is the supermom bella). definatley huggabugs! thanks for the chance! WOW, great Blog candy!! Love your cards too. Darling cards....love 'em. My favorite Bella stamp is currently the bedbuGG HUGGABUGG...too cute! Wow what a win.Great you are offering someone else the chance to win some.My favourite is daisybella.I don't have a blog but will still spread the word. How generous of you! I love, love, love Matilda Muffinbread. She was one of the first ones I got and I use it quite frequently. In fact, it's on my husbands valentine card. Thanks for the chance at some candy...this is one of my first visits to your blog (via the Two Scoops Rice one). 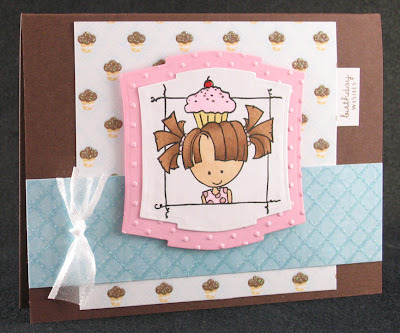 Your creations are awesome and you have all the best stamps (Anya, Bellas, etc.). My favs have always been the Bellas but the Bittyblooms are up there too! Thanks for sharing and thanks for the op to win!